­Since its humble beginnings 75 years ago, the K­elley company has worked to bring value information for cars, recreational vehicles and motorcycles to buyers and sellers. Its Kelley Blue Book has become the standard automotive price guide for dealers and consumers alike. Now Kelley is using the Internet to make that information even more readily available. In this article, we'll explore Kelley's history, show you how to use its price guides and Web site, and explain where it gets pricing information. ­L­es Kelley never intended to start a publishing company. He began in 1918 by selling used cars, starting with three Model T Fords in a Los Angeles parking lot. With the help of his younger brother, Buster, Kelley turned his small lot into a thriving used car sales and repair business within a few years. Kelley began printing lists of used cars that he wanted to buy, including how much he would pay for them. He sent these lists to other dealers and banks. Before long, Kelley's lists were on the desk of every sales manager in the county and people came to rely on them for accurate appraisals of an old car's value. In 1926, Kelley published his list in book form for the first time. He named it after the Social Register, a list of the important and elite people in local society often referred to as the Blue Book. ­The Kelley dealership­ continued to expand until it was the largest used car dealer in the country. The Blue Book increased in popularity as well, moving beyond its regional boundaries and becoming a nationwide car value guide for dealers. In 1962, the Kelley family sold off their dealerships and focused entirely on the Blue Book. In the 1980s and 90s, Kelley started using computer software to track prices. In 1992, it offered dealers a computer program that allowed them to print out a label displaying the condition, mileage, and optional equipment on a used car. The label also included the Blue Book price and the Kelley Blue Book official seal. In 1993, the Blue Book was finally released as a consumer guide. The last major change in publication format came in 1995, when www.kbb.com was created. 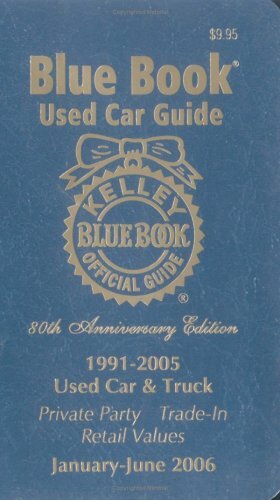 Kelley Blue Book stayed in the Kelley family for three generations until 2000. That year, Bob Kelley (Buster's son) and his son Mike retired from the company, leaving it in the hands of new leaders who kept the famous name and worked hard to maintain the tradition of trustworthy and accurate information. Today Kelley employs around 200 people and has offices in Irvine, California and Detroit, Michigan.